A week ago the words “a week ago” would have meant something. Somewhere along the four plane rides it took to get here we have lost our sense of time, and Bhutan’s “go with the flow” way of life has given us no reason to restore it. 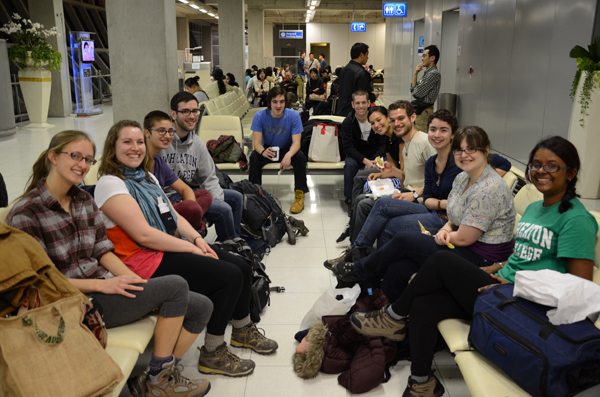 But it did take time to get to this point so allow us to backtrack: Tokyo. Japanese culture has a huge presence in the world. Even though we got to see some aspects of Japanese culture from the airport (from the high tech panel of buttons on the toilets to the traditional origami museum) I would have loved to see more of Japan. After Tokyo, we arrived in Bangkok where we quite literally got our first taste of Southeast Asian culture; we ate the spiciest meal I have ever had in my life. Adjusting to the spice-loving palate of Bhutan is probably one of the biggest changes we will have to make to our normal lifestyle. We also had our first glimpse of Buddhism when we visited the Reclining Buddha in Wat Pho. The monuments and architecture were incredible, colorful tile pyramids towered over stone gardens. In the park we went to afterwards we saw exotic plants that we would never see in the states. When we finally arrived in Bhutan, our plane landed in the city of Paro. Immediately we saw prayer flags blowing on the mountainside. The wind brushes them and returns to the person who hung them, bringing the good luck of the prayers. We brought our bags to the hotel where we would stay for the next three days and our guide Tsewang brought us to the national museum. There we saw cultural and historical artifacts from Bhutan such as masks used for dance rituals, and learned about Bhutan’s natural history. After that we went to one of the oldest temples in Bhutan, Kyichu Lakhang, which was built on a demoness’s left sole in order to pin her down as she was an obstacle to the spread of Buddhism. Inside there were statues of Buddha and other gurus surrounded by offerings of brightly colored sculptures. Monks were gathered seated on the floor chanting and playing horns and drums: worshiping through sound. Prayer wheels surround the temple. They are spun clockwise and the layers of written mantras inside are like thousands of spoken prayers. The next day we visited Paro Dzong, a fortress monastery that houses both monks and government officials. 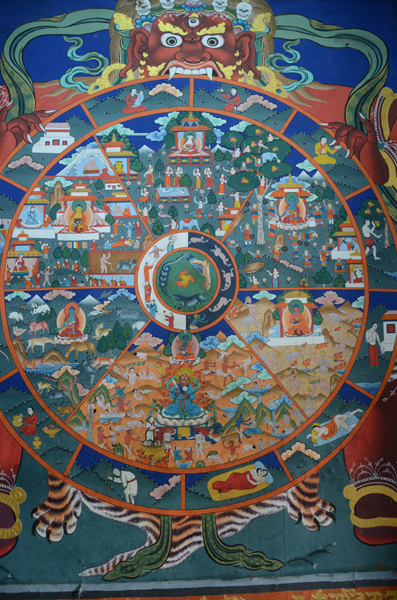 Tsewang explained the paintings on the wall depicting Buddhist beliefs. The most important picture displayed the wheel of life. Based on a person’s deeds while living and the karma they have accumulated, a person can be reborn into one of six worlds: human, god, hell, demigod, animal, and hungry ghost. It is best to be born as a human because only in this world can you find release from samsara, the cycle of birth and rebirth. The idea of reincarnation is crucial to Buddhist belief. 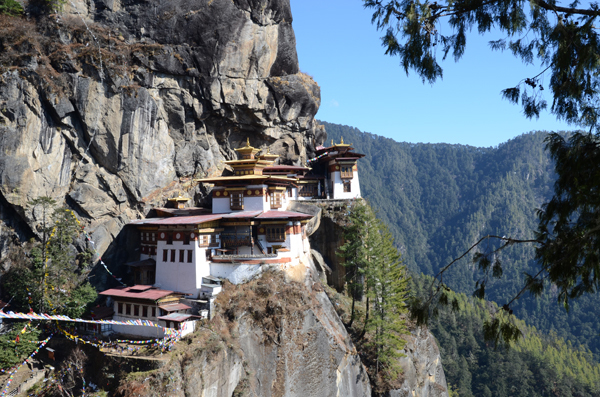 Then we hiked to Tiger’s Nest, one of Bhutan’s most sacred temples (lakhangs) tucked away in the side of a mountain. Its name and location come from Guru Rinpoche’s flight to Bhutan on the back a tiger to bring Buddhism from Tibet. It was a long walk and adjusting to the altitude was difficult, but the scenery never got old. Looking out there were mountain ridges everywhere covered with lush vegetation and snowy peaks. When we eventually reached the Tiger’s Nest, about two hours later, we were awestruck by the beauty of Buddhist worship. There were intricate shrines and hand painted pictures to honor important holy figures and tell stories from Buddhist teachings. Guru Rinpoche was the most notable; he has eight manifestations and wards off fear because he is always by your side. We received blessed water from a monk and we saw followers of Buddhism from all over the world, such as Germany, come to prostrate. The smell of incense permeated the air. 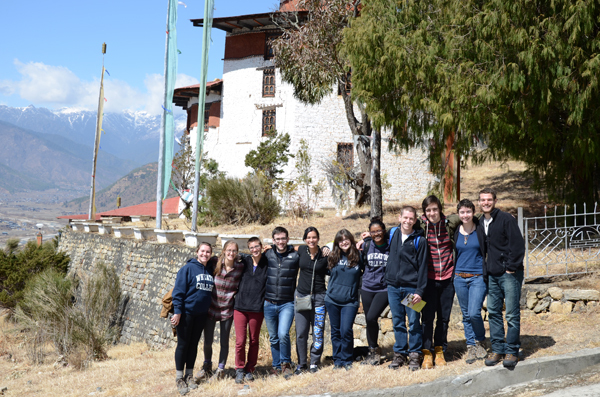 We left Paro the following day and made the last leg of our journey to Royal Thimphu College where we would finally settle in for our semester in Bhutan.